Rising from the ashes of Melbourne’s dormant metal scene, Decimatus formed with one intention: to make the music they love that no one else is playing. In early 2010, mixing killer groove riffs with brutal fast pace drums, Decimatus did just that. 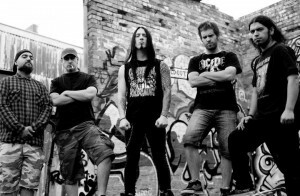 Writing the music for their EP ‘The Betrayer’, Guitarists Mather and Booga, drummer Adam and bassist Andrew didn’t become a complete entity until vocalist Tommy joined the fray in mid 2010. Since then they have literally been decimating the Melbourne metal scene, shredding stage after stage. With the release of their debut EP “The Betrayer” Decimatus have only just begun to shape the face of Melbourne Metal … The world is next.